Can cats help advance cancer treatment where mice have failed? 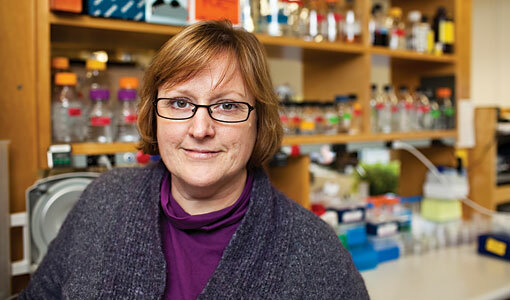 In what could signal a new direction for cancer research, McNiel hopes to bridge that disconnect by studying the disease in cats. The work could produce breakthroughs to advance cancer treatment in cats and humans. As companion animals, cats live in the same environments as their owners, and the cancers they develop tend to occur in similar ways to those in humans. Whereas mouse cancers usually are small and contained, feline cancers come in various sizes and spread throughout the body. “We think that [human and feline cancers] may be parallel in their underlying causes,” says McNiel. Studying cancer in domestic cats may produce more reliable results than using lab mice and could result in more effective treatments in the long run. McNiel studies squamous cell carcinoma, a cancer of the mouth typically caused in humans by tobacco use, though increasingly by human papillomavirus (HPV). It is also one of the most common feline cancers. 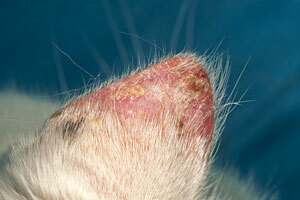 Squamous cell carcinoma is usually quite aggressive in people and animals, metastasizing quickly and resisting traditional treatments. “We’ve treated these cats with surgery. We’ve treated them with radiation, and the average survival time is just a few months,” says McNiel. Those grim statistics make this cancer a good candidate for study in a clinical environment, McNiel says, because pet owners might be more willing to consider a nontraditional therapy when faced with such dismal survival rates. In research funded by the Morris Animal Foundation, McNiel is investigating the potential of a drug used to treat human cancer. The designer peptide called Anginex contains 33 amino acids that bind to another protein in the blood vessels that supply tumors with growth-promoting nutrients and oxygen. The bound drug helps switch off the flow of blood to the tumor cells, essentially severing their lifeline. Thus far, McNiel and her colleagues have conducted successful safety trials to ensure that the drug won’t harm cats—a necessary first step in research with pets. They tested the drug in the laboratory, using feline blood vessel tissue, as well as in a dozen cats being treated for squamous cell carcinoma at the Foster Hospital for Small Animals at Tufts. Now the researchers are preparing for a larger study, in which 25 cats will receive the drug to determine whether it does indeed shrink their tumors. Unlike large clinical trials where several hundred animals might be treated to statistically prove the effectiveness of a particular drug, this small-scale study is more qualitative, examining how the drug works and how it might be developed further, McNiel says. One possibility is administering the drug in concert with other therapies, such as radiation or chemotherapy, potentially augmenting their combined ability to fight the disease. Another avenue McNiel is exploring is to reverse the drug’s function to actually improve blood flow to the tumor. While that might sound counterintuitive, it could, for example, make chemotherapy more effective by allowing more chemicals to attack the tumor. Once the initial studies are done, McNiel says, the researchers can move on to research that would use Anginex in addition to conventional treatments.